Leftist opposition leader Alexis Tsipras is pressing a smart campaign to end austerity. But it may be too late—the oligarchs and neo-Nazis are sharpening their knives. 10 percent, still go unpunished for attacks on migrants, gays and leftists, often carried out with the connivance of the police. It was against this backdrop that Syriza leader Alexis Tsipras traveled to Germany, where he met with Finance Minister Wolfgang Schäuble, and to the United States on a mission to assure the world that he is not some radical firebrand bent on tearing down the house but a reasonable man who wants a fairer future for his country and for all of Europe. Visiting The Nation’s offices, Tsipras set out his three key aims: to end the catastrophic experiment of austerity; to hold a European conference to solve the debt problem; and to promote growth through a new European Marshall Plan. He also spoke about problems endemic to Greece: the concentration of wealth and power in the hands of the oligarchs, and the culture of clientelism and tolerance for corruption. He had less to say about how to rebuild the Greek economy and make it sustainable for the future. The Syriza leader’s trip was a smart move, but it may be too little, too late. 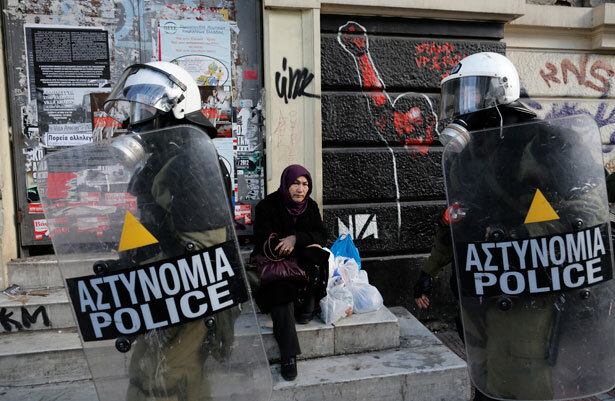 This is a moment of danger, for Greece and for the rest of the European south. As the government hammers home austerity at the expense of democracy, human rights and human lives, the strategy of confrontation—driven now by the right—could easily become a trap, a war the left is likely to lose. Worn down by three years of budget cuts and tax hikes, people are tired of strikes and occupations. The metro stoppage became a symbol of resistance, but it had mixed support among Athenians, not only because of the disruption to their lives but because some of the workforce, padded with clients of the last New Democracy government, are better paid than many other public sector employees—and they still have jobs. Most Greeks want an end to austerity; they also want real reform. The worst outcome for Greece would be the further rollback of workers’ rights and the social safety net without a purge of the corrupt elites and their clients in the media, in business and in the unions—a nightmare of exploitation policed by the lads from Golden Dawn. Greece, Tsipras said, is on the front line of a continent-wide conflict between capital and labor; we have been here before. He has a point, but the military metaphor is misleading. Resistance won’t be enough; what’s needed is a vision that answers to and can transform present realities. In Greece and beyond, its outlines have barely begun to emerge from the smog.